Seaweed based for a naturally salty flavour. Real Thai. All natural. Use instead of salt. Gluten free. No artificial colours, flavourings or preservatives. Suitable for vegetarians & vegans. Thai cuisine is famous for blending sweet, salty, spicy, sour and bitter flavours in one dish, with fish sauce widely used as a salt alternative. 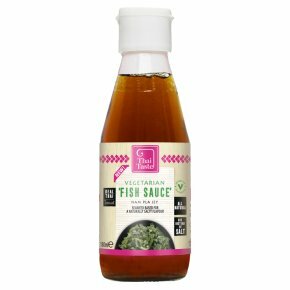 This vegetarian and vegan friendly version is made from seaweed, so that everyone can enjoy authentic Thai flavours. If you like Thai cuisine. You'll love our range of authentic Thai ingredients.